I am a huge fan of braving the elements and getting back to nature when I travel which usually involves me carting around my trusty bell tent (bought from soulpad.co.uk) which I’ve had for the last 10 years. It’s a great tent with loads of space and I love the feel of camping under real canvas and the character of it. My bell tent has seen most of the British Isles with me and I always get loads of comments about it when I go camping. 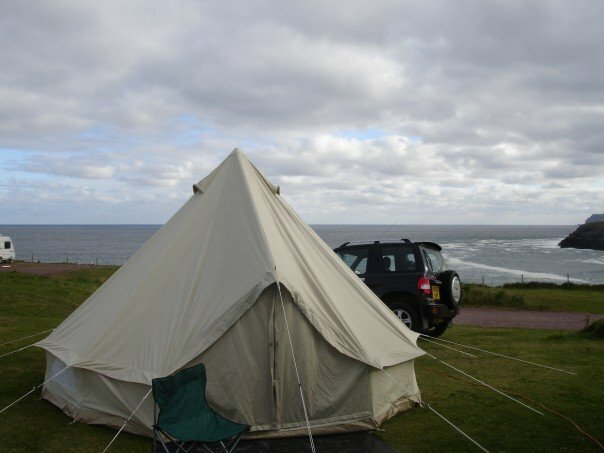 After my last visit to the highlands last August when I was nearly blown away off the coast of John O’Groats, it was clear that the bell tent is unlikely to stand up to the Scottish weather again this Autumn so after some reluctance I have decided to buy a new tent to use on less fair-weather trips! As it turned out I managed to get a pretty good deal on the Vango which included some extras such as the extra footprint groundsheet and inner carpet (I do like my home comforts even when braving the elements!). Full review to follow after my trip.